Salmon season has reached the half time. These first two weeks of Month has been super warm, even historically warm here in Tornio valley. Air temperatures have been between 25-30 degrees day time. Nights have been at least little colder between 10-15 degrees mainly. 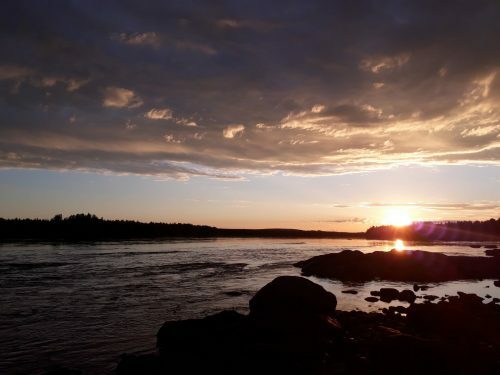 These are dream weathers for sun bathers, but hardly the dream of salmon fishermen. Water temperatures have been between 17-21 degrees, now it’s the latter. Water level is still very low and due to heat it has been still sinking a bit. Everyone who has tried salmon fishing can understand that conditions aren’t the easiest for catching fish now. 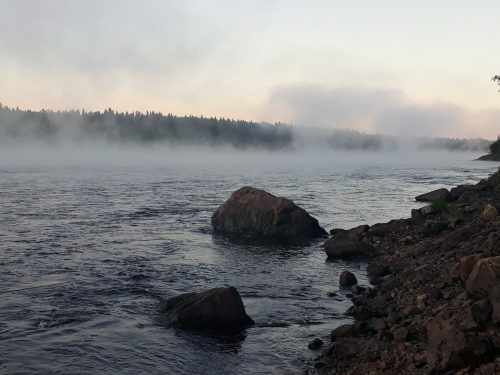 With situation like this at river you need to focus night and early morning fishing, when the temperature of the surface water gets little colder. It has been also lately the time fish have been moving most. Using small tube and hook flies (2-5 cm wing), wobblers with small movement and fishing with the speed have been key for success in both boat and fly fishing. Fresh beauty in hands of happy guests Hannu and his daughter Larissa. All things included we’ve been enjoying pretty good fishing last week and half. Last week we caught few guided boat salmon and lost a few as well. 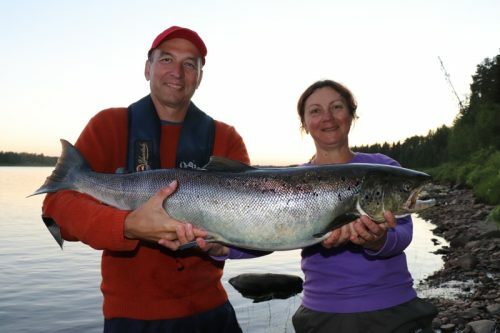 Biggest salmon of the week was nice plus 20 pound fish caught by our Russian guest Mikhail and his wife Inessa. 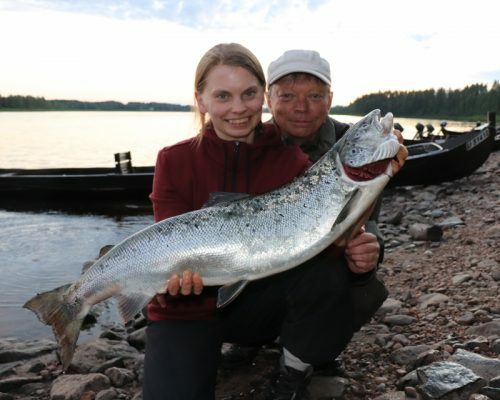 Salmon took red and gold wobbler in river mouth of Naamijoki and the fight was one to remember. After few heavy runs guys realized that fish has been already been hooked before. There where big amount of line and one wobbler in its mouth. That line and older wobbler get stocked in Mikhail’s line and Sane, who was guiding them with mesmerizing flow, needed to pull all the tricks to get the beauty in the net. Hats of for Sane, he was definitely the guide of the week! In fly fishing beginners in double hand fishing from Switzerland Rene, Michael and Manuel were enjoying two fabulous fishing nights. They played three good salmon, but couldn’t land them unfortunately. Michael’s fish was already in touching distance, but it took one last run for the freedom. Mikhail & Inessa and their first salmon ever! Last week or so there has been +/- 1000 salmon running to river per day. These are good numbers in July. This week has started very well. Even though it’s still very warm and river temp is up, our guests have already caught 4 fish, 3 of them guided. Even in the heat you can have very good salmon fishing, you just need to focus in right timing and details! 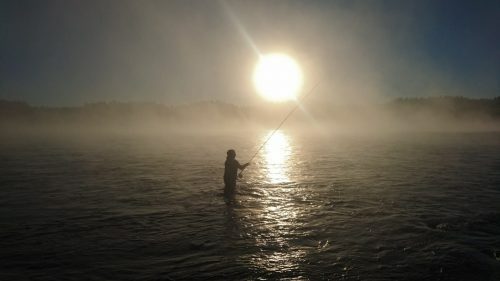 Magical misty morning in fly fishing pool.